We all want the best for our children, we want them to be safe and secure and make sure that they never ever come in front of harm’s way. We would go to any lengths to ensure that our babies are protected at all times. To make your babies safe and secure in your house, you need to childproof your house so that your child doesn’t get hurt. Childproofing involves installing gates to prevent your children from entering a hazardous area or fixing the sharp parts of the furniture. In order to get everything safe and secure before your child gets mobile, make a chart and a checklist to know that you have covered everything. It’s best if you consult an expert first who would give you a rundown of everything and make sure you inspect everything thoroughly to prevent missing out anything. As you go on inspecting, make a chart of what needs to be done. Divide the chart from various areas of the house, such as the kitchen, bedroom, stairs, bathroom and etc. After you’re done with the inspection, make a checklist of what needs to be done and what has been done up till now. 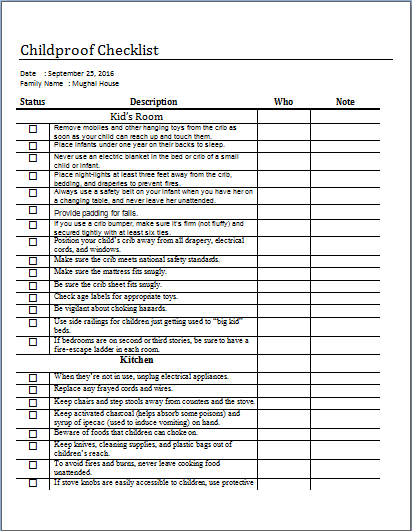 The chart and the checklist will give you a better idea of how to childproof your house and get you more organized. You can always differentiate the various areas of your house on your checklist and chart by using different colors. This would give you a better idea and make things easier to understand. Your child’s safety is the most important thing ever, make sure you complete the chart and checklist thoroughly and get it approved by a professional as well!